picture of me in a Natty Light box! But don't worry, I don't drink it ... MOL! Oh Simon, that picture is fantastic!!! Simon you look so cute with your head sticking out through that hole. Ha! That's a terrific photo! Happy International Box Day! Wow! You are all natural and light! laser-glazed eyes are telling a different story... (we're just teasing). Great photo, great IBD post! Haha! Simon, you are so silly! Happy Box Day!! MOL. Good one, Simon! Happy International Box Day! Cool Picture! Just right for the long haoliday weekend! Ha ha ha! Pawsome dood! Oh MOL! 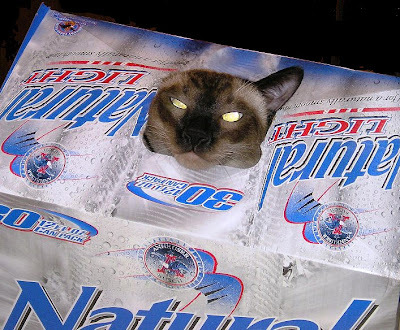 That is SUCH a great picture of you inna box. Thanks so much. LOVE the photo! so cute!